A very healthy woman in her 20's (who, however, is a heavy smoker) presented with 4 days of waxing and waning substernal chest pressure radiating to the throat and both shoulders. It was not sharp, not pleuritic. There were no myalgias, no viral symptoms, no F/C/S. Looking at her, she was the picture of health, and I thought to myself: "Is there any possible way she could have an MI?". My answer, of course was yes. in this case, and others. I found this very interesting and worrisome. --The most obvious is ST elevation is in V3-V6. This could be normal, myopericarditis, or MI. --However, there is another finding which had me very worried: ST depression in lead III and opposing ST elevation in I and aVL. --The ST elevation in aVL is only 0.5 mm, but the QRS has even less amplitude. Notice the QRS voltage is less than 0.2 mV (less than 2 mm) in aVL, and the ST segment is nearly 1 mm. So the proportional ST elevation is quite high. This is only partly due to the difference in axis between the QRS and ST segment. QRS axis is 60 degrees, towards lead II, and the ST axis is 0, towards lead I.
Pericarditis only manifests ST depression in lead III if it is focal to the high lateral wall. Focal pericarditis is unusual, but focal myocarditis is not. Most pericarditis is electrocardiographically diffuse, with an ST vector towards leads II and V5 and no reciprocal ST depression except in aVR. The ST deviation is less. Thus it is dymamic, which is not usually associated with myo-pericarditis, but probably because serial ECGs are not frequently obtained for this condition. The troponin I returned at 18.9 ng/mL. Is it MI or myocarditis? See this excellent study of patients with suspected MI and normal angiograms (from 2001, it is still the best study I can find). Of 45 patients, 35 had myocarditis by Indium scintigraphy (unfortunately, I don't know how accurate this test is, and it seems that no diagnostic test is terribly accurate for myocarditis. Even the reference standard, endomyocardial biopsy, often misses the involved myocardium). --Half of them had focal myocarditis and half diffuse. --28% had reciprocal ST depression. --62% had regional wall motion abnormalities. -- In the U.S. Myocarditis treatment trial, 89% of these highly selected patients (not ED patients) had a syndrome consistent with a viral prodrome. Thus, unfortunately, if there is a wall motion abnormality, one is really unable to differentiate acute MI from myocarditis in the emergency department. I consulted our cardiologist, who sent his echo tech, and we obtained a high quality, Definity contrast echo. This was done and showed a lateral wall motion abnormality. So we activated the cath lab. The interventionalist was very pleased to come evaluate this young woman's coronary arteries, agreeing wholeheartedly that you can't "sit on" someone all night who has chest pain and a positive EKG and troponin. The angiogram was completely normal. The left ventriculogram showed a dense lateral regional wall motion abnormality, very highly suggestive of focal myocarditis. Serial troponin I went from 18.9 ng/mL, to 19.7 at 6 hours, to 16.8 at 9 hours, to 16.1 at 24 hours to 11.5 at 42 hours. Now there is much more widespread ST elevation, with no reciprocal ST depression. This is classic myopericarditis. An MRI of the heart confirmed inflammation of the lateral wall, all but diagnostic of myocarditis. She was treated with colchicine and ibuprofen. When the differential diagnosis is myocarditis vs. acute MI, it is difficult to make any conclusions without an angiogram. In half of myocarditis, there will be a wall motion abnormality (focal myocarditis) and it will be impossible to distinguish from MI. If there is no wall motion abnormality, one can be reasonably confident that it is diffuse myocarditis and avoid the emergent angiogram. I am not at all troubled by activating the cath lab to be certain that she was not having a coronary thrombus. It put everyone's mind to rest. Very interesting case Dr Smith. What is your opinion on the utility of Spodick's sign for differentiating AMI from myopericarditis? In the initial ECG the TP segment appears to be down-sloping (mostly in V2-V4), which made me think this might not be AMI. I haven't been able to access any full text documents discussing its accuracy and I've only ever used it to guide my initial focused assessment. I don't have any data on it nor do I know of any. Reportedly, Spodick found it in 80% of his pericarditis patients. I just read the original article that this purportedly comes from and don't find it. Furthermore, there is no data (that I am aware of) regarding its specifiticy for pericarditis. Is it present in early repol? I haven't paid attention and am not sure. Is it present in MI? I haven't paid attention and am not sure. There are no papers on it that I am aware of. I will pay more attention to it in the future. 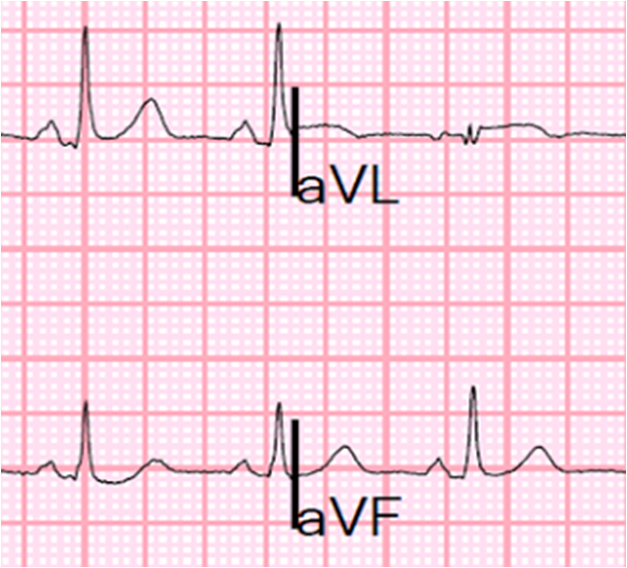 Furthermore, in this ECG, it is only present in V2 and V3 but not in the leads of interest. What do you think about the ST depression in V1? I am under the impression that classic diffuse myopericarditis is only "allowed" to have ST depression in aVR. ST depression should not be seen in V1 in this scenario, correct? In general, yes. But V1 is in a similar orientation to aVR, depending on anatomy. If it is place high, then it can give a reciprocal view to the apex. SUPERB challenging case (!) - with MANY lessons to be learned. Given lateral localization - I was not considering acute myocarditis. Below my rationale for assessment based on the initial ECG (written prior to reading Dr. Smith's evaluation). THANK YOU Steve for the PEARLS regarding acute Myocarditis. I feel better at least that all agreed with need for an acute trip to the cath lab! My differential diagnosis for the history of a 20yo woman with chest pressure and the initial ECG shown includes the 3 causes of ST elevation that are most commonly contemplated: i) Acute STEMI; ii) Acute Pericarditis; and iii) Early Repolarization. While possible that there might be an underlying component of early repolarization - there is clearly MORE on this tracing. Early repol does not produce the ECG picture seen in lead aVL (nor does it produce reciprocal ST depression as seen in lead III). This leaves us with consideration of acute Lateral STEMI vs Acute Pericarditis. While the history of a young woman would seem to be more suited for pericarditis - I am concerned about acute LCx (Circumflex) occlusion because: i) The ST elevation seen is not quite as generalized as I'd expect with acute pericarditis (not seen in III,aVF,V2); ii) The ST elevation in the "highest lateral lead" - aVL is disproportionately tall given the tiny QRS amplitude in this lead - and it looks like the shape of an acute infarct; - AND - iii) the T wave appears to be starting to invert in aVL - whereas with pericarditis, one generally does not see T inversion until after ST elevation returns to the baseline; and iv) there appears to be some reciprocal ST depression in lead III. 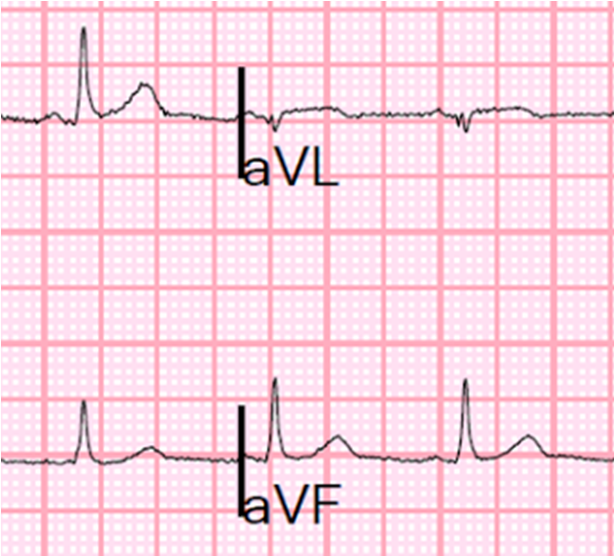 ST elevation is also seen in leads V3-thru-V6 - though the most worrisome picture is in leads I,aVL. There is some J-point slurring in lateral precordial leads - so perhaps there was some baseline early repolarization - but despite this patient's young age, I'd interpret this as an acute lateral STEMI until proven otherwise. P.S. Stat Echo might be invaluable in providing support for acute stemi by showing localized wall motion abnormality. This is one quite interesting case. And I totally agree with you Dr Grauer, I don't see how echo would have changed management. 1) I suppose either works. do you consider the (fishhook appearance) of chest leads R wave as BER ?